First they gave us a high-res tour of Mars — now Microsoft has made the largest and clearest night-sky map ever. It's a terapixel image: 1,000,000,000,000 pixels. The software giant's Terapixel project stitched together 1,791 pairs of red-light and blue-light plates from telescopes in California and Australia. The result is the map above, which covers the night sky of the northern and southern hemispheres. Using WorldWide Telescope and Bing maps, you can zoom in on the cosmos, peering through the dust of the Milky Way to distant galaxies. Microsoft announced Terapixel July 13 at its annual Research Faculty Summit. To view every pixel of the image, you'd need a half-million high-definition televisions. If you tried to print it, the document would extend the length of a football field, Microsoft says. 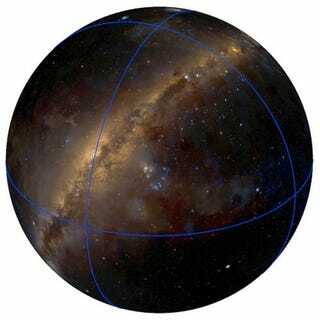 The project required re-computing all the image data collected by the Digitized Sky Survey during the past 50 years. The images, produced by the Palomar telescope in California and the Schmidt telescope in Australia, each cover an area of the cosmos six and a half degrees square. The map's quality and clarity stems from computerized changes to the original images, which have varying levels of brightness, color saturation, noise and vignetting, which is darkening of the corners. Developers ran parallel code on 512 computer cores in a Windows High Performance Computing cluster, and were able to process the raw digitized data in about half a day, according to Microsoft. Once the files were decompressed, they had to undergo some changes to correct the vignetting problem. Red and blue plates had to be precisely aligned to make a color image, and then everything had to be stitched together, which took about three more hours. Terapixel then used an image optimization program to create a seamless, spherical panorama of the sky. That took about four hours, according to Microsoft. The final image is 802 GB.